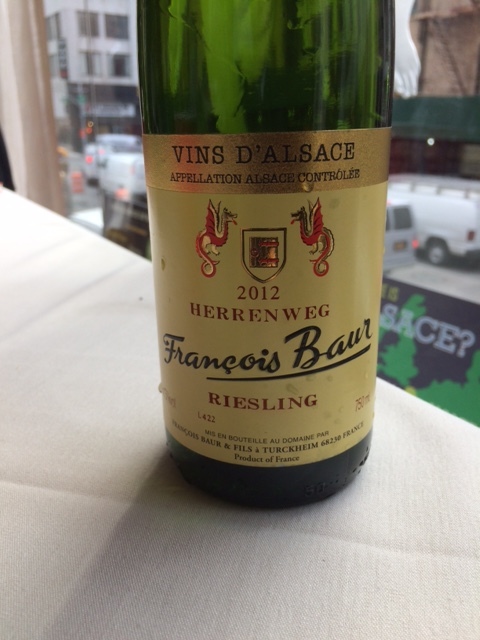 At the Wine Media Guild’s (WMG) recent lunch on April 1, 2015 at Felidia, there was no fooling around: the theme was Alsace, featuring the aromatic, earthy and food-friendly white varietal wines it produces so well — a fitting way to kick off a tardy (New York) spring. The only joke of the day: that these wines don’t receive more recognition and commercial embrace in the US. Sponsored by WMG member Tracy Ellen Kamens and hosted by Wines of Alsace, represented by Alsace educator May Matta-Aliah (DWS, CWE), the tasting presented a useful snapshot of the current Alsatian wine scene via 15 top producers. Appropriately, it was organized by the region’s primary grape varieties — Pinot Blanc, Riesling, Pinot Gris and Gewürztraminer. A selection of Crémant d’Alsace, the good-value sparkling wine appellation of Alsace, was also on offer, including a refreshing rosé sparkler (from 100% Pinot Noir, Alsace’s only allowed red grape) by Pierre Sparr. Full disclosure: I have long been a fan of these wines, going back to my formative days as a college student in southwest Germany, essentially right across the Rhine river from Alsace. An ancient wine region, Alsace is a veritable wine-making Shangri-La. Despite its relative northerly latitude — practically that of Champagne — it benefits from the rain shadow of the Vosges mountains to the west, which blocks the oceanic influence from the Atlantic. This makes it the second driest district in France. It also enjoys long, warm autumns that bequeath dependable ripeness and distinct aromatics to the noble grape varieties. 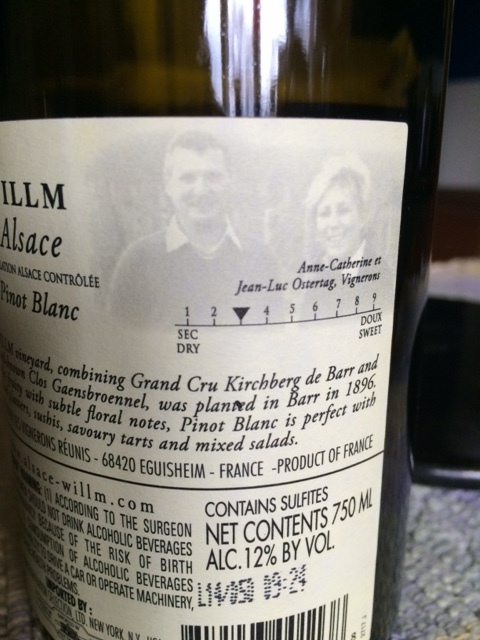 And, as our speaker Matta-Aliah pointed out, Alsace possesses 13 distinct soil types within a 75-mile stretch. Coupled with the myriad micro-climates and site specific aspects found in the Vosges foothills, where most of the vineyards are located, Alsace presents an amazingly diverse winemaker’s palette, leading to highly individualistic wines, even among those of the same variety. Our April Fools’ tasting clearly illustrated this. As at any tasting, I had some favorites. Pinot Blanc is a Rodney Dangerfield grape, often with justification — it can be mousey or nondescript in the wrong hands (or place). In the triangle of Alsace, Baden (and the Pfalz) and the Alto Adige, however, Pinot Blanc can be compelling. 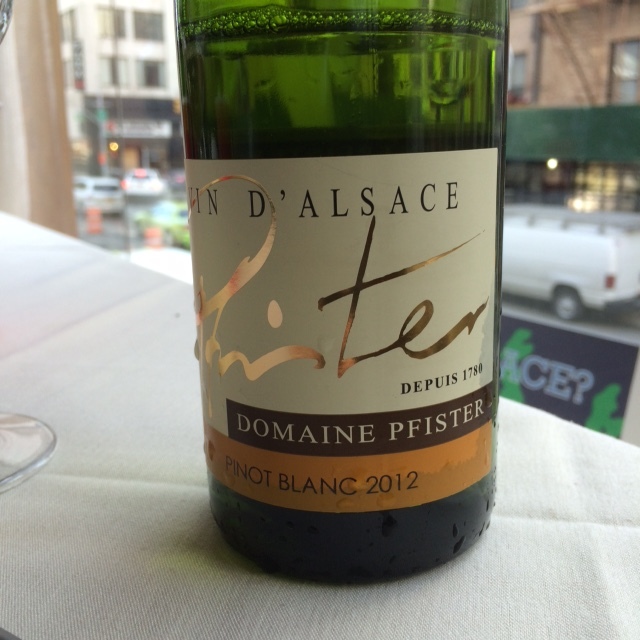 The Pfister Pinot Blanc 2012 ($24.00) is one such wine. A focused, mineral-driven nose with stone fruit and orange peel notes, the Pfister had great energy and zip on the palate, pretty stone fruit character and a long citrusy and mineral finish. It was also a star at the table, working beautifully with the Rouget fillet in broth, with fresh spring peas. 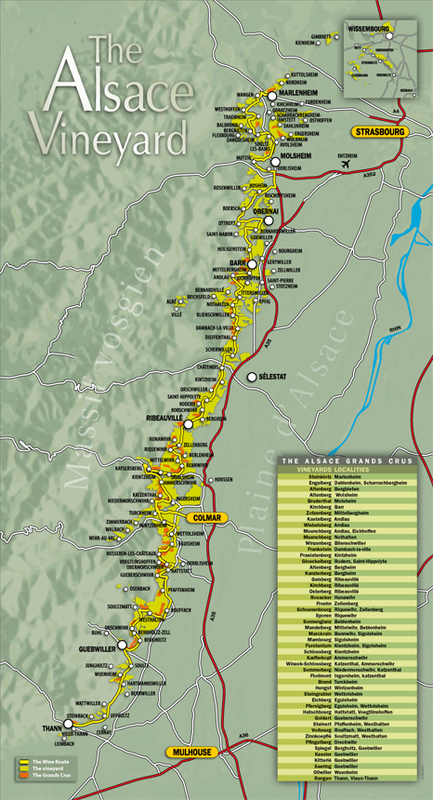 Alsace produces world-class Riesling, which is generally bigger and drier than its German counterparts (with plenty of exceptions, however!). While all the Rieslings assembled were quite good, I was duly impressed by the Francois Baur Rieling Herrenweg 2012 ($20). A pretty nose of orchard fruit and talcum powder, it exhibited mouth-watering verve on the palate, with impeccable balance and great length — a complete package, and a bargain for the price. 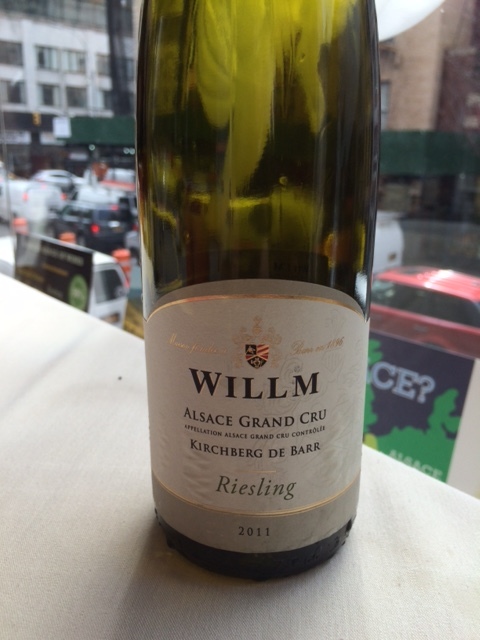 One of the values of the tasting was the Willm Riesling Grand Cru Kirchberg de Barr 2011 ($23.00), one of 51 Grand Crus in Alsace, i.e. specific vineyard sites that have been identified for excellence over time. Since 2012, these Grand Crus are considered appellations in their own right. 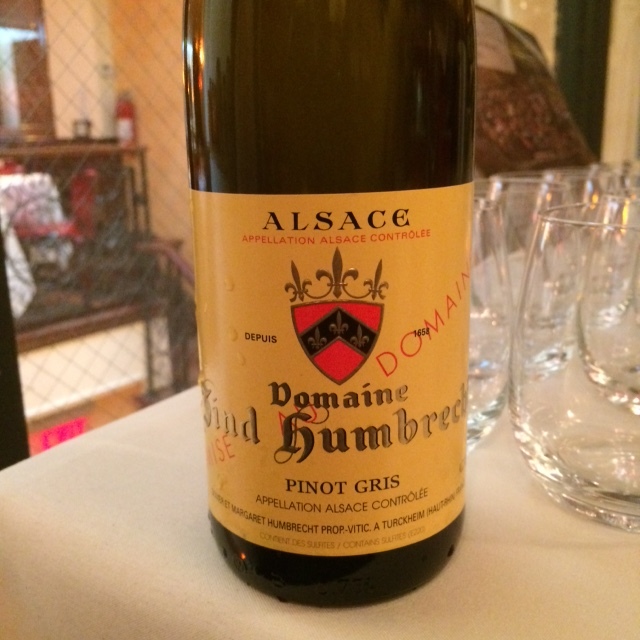 My overall favorite of the tasting was probably the Zind-Humbrecht Pinot Gris 2012 (26.00). A complex, earthy nose with aromas of stone fruit preceded a full-bodied, mouth-filling palate brimming with heady ripe fruit on mile-long, mineral finish. Its earthiness and underlying acidity made it a perfect partner for the nettle risotto served during the lunch. Quite a wine — spring in a bottle. Owing to the benign climate and traditional vineyard practices, organic, biodynamic and/or sustainable viticulture is widely practiced in Alsace. In fact, eight of the 15 producers represented at the tasting are certified as either organic or biodynamic. So, why doesn’t Alsatian wine do better on this side of the Atlantic? According to Matta-Aliah, Alsace went somewhat overboard with bigger, riper wines and residual sugar (RS) levels in the 1990s, which confused consumers who were expecting drier wines. Also, with the shape of the bottle (the”flute”) and the German-sounding names, many confuse Alsatian wines with German ones, and then compound the error by assuming that the wines are therefore sweet. Competition is also intense — there is always a new, hot region of the moment. But Alsace hasn’t stood still. Producers have dialed back on RS levels; many even indicate relative dryness/sweetness on the back of the bottle. Most Pinot Blancs and Rieslings are dry. Pinot Gris and Gewürtztraminer are frequently off-dry, but with beautiful balance, said Matta-Aliah. My simple conclusion: it’s high time to revisit Alsace’s aromatic, food-friendly and earth-friendly white wines. This entry was posted in Eco-friendly Products, NYC Events, Wine, Wine + Food and tagged Alsatian wines, Francois Baur, May Matta-Aliah, Pfister, Willm, Wine Media Guild, Wines of Alsace, Zind-Humbrecht. Bookmark the permalink.